Best Android Lookout : Galaxy Beam : The Slimmest nHD Projector Phone ! Galaxy Beam : The Slimmest nHD Projector Phone ! The Galaxy Beam I8530 is Samsung's fresh new attempt at making a nHD Projector Phone. This new phone is known to be sleek and thin, unlike its predecessor Galaxy Beam I8520. Samsung has made a powerful projector phone, the Galaxy Beam I8530, which can be operated with one hand easily and can coolly fit in your pocket. This justifies the 'slimmest projector phone' tag line. The Beam I8530 is available online in India for around Rs. 30,000 ($500 US dollars, 385 UK pounds). Whats new is that the Beam I8530 has a 4 inch screen, Dual-core 1GHz Cortex A9 Processor with a Mali - 400 GPU, which should guarantee you a lag free experience. In the box you will also get a much needed extra Li-Ion 2000mAh battery along with a battery charging phone stand. 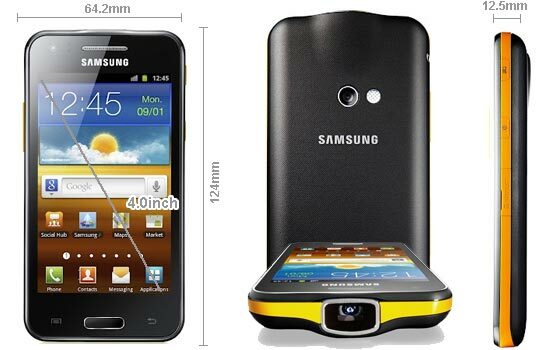 - The Galaxy Beam I8530 is only 12.5 mm thick compared to the earlier 14.9mm of the I8520. - It has 4.0 inch TFT LCD Screen. - All the dimensions (124 X 64.2 X 12.5 mm) can be seen in the image above. - The top of the phone behind has a slight bulge to accommodate the nHD Projector. - The phone weighs only 145.3 g.
Advice : TFT LCD has been used instead of AMOLED, but it should not be a bother because your mostly gonna use the nHD Projector for watching videos. - Projector Display size can be up to 50 inches. - The 15 lumen nHD pico - projector has a resolution of 640x360 with an aspect ratio of 16:9 (widescreen). - nHD is 360p which is one ninth the resolution of a 1080p HD television. 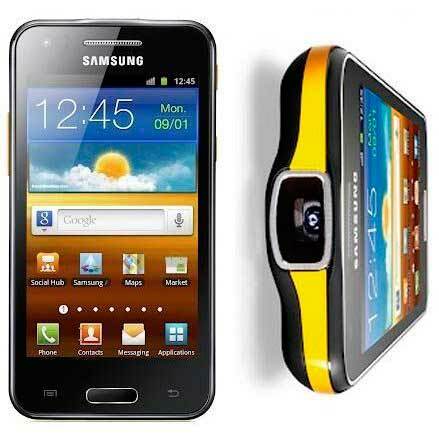 - The phone screen is a 4.0 inch capacitive TFT touchscreen with 16M colours. - The 4 inch screen has a resolution of 480 x 800 with 233 ppi pixel density. - Multi touch is supported. 2G NETWORK: GSM 850 / 900 / 1800 / 1900. 3G NETWORK: HSDPA 850 / 900 / 1900 / 2100. WLAN (Wi-Fi) : Wi-Fi 802.11 b/g/n with DLNA & Wi-Fi hotspot. BLUETOOTH : version 3.0 with A2DP & HS. - Dual Core 1Ghz Cortex A9 processor on a NovaThor U8500 chipset. - GPU used is Mali 400 which is ideal for playing HD videos and games. - Android OS Gingerbread 2.3.6 is used, which is the most widely used Android OS till date. Advice : The above said specifications are ideal for HD video playback, the smoothness and interface will undoubtedly be very good. - It has an internal memory of 8 GB. - RAM present is 768 MB. - MicroSD card slot expandable to 32 GB. - MicroUSB v2.0 is used. - Main primary camera is 5 megapixel, 2592 x 1944 pixels with autofocus & LED flash. - Secondary front facing camera is a 1.3 MP camera. - Camera features are Geo-tagging, touch focus, face and smile detection. - Video recording is 720p@30fps, video light is present. Advice : Relatively cheaper camera is used considering the price range, Samsung must be focusing only on the nHD projector. - 3.5 mm jack is present. - Standard battery, Li-Ion 2000 mAh is used. - An extra spare battery of the same specification above comes in the box. - The spare battery can be charged with the phone stand which is also present in the box. - Battery consumption will be high if the projector is used for a long duration. - The 2000 mAh battery will last up to 3 hrs with the nHD Projector ON. Why you should Buy this phone! - If you give presentations on the go, this little projector phone will do a splendid job. - You can effortlessly watch your favourite movies, pictures and videos on the go anywhere. - Portable Pocket nHD Projector on a phone, is as new as it sounds, and gets the job done remarkably.